Osaka is a new pattern from Mason & Wolf. A delicate dusting of glittering leaves and starbursts decorate this Japanese-inspired paper. 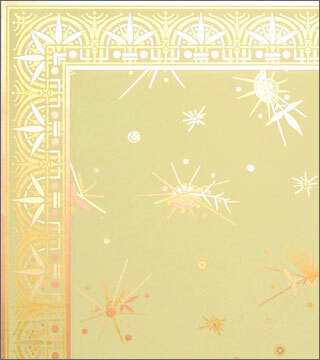 Gold, copper and bronze inks on a creamy yellow ground produce an effect that is positively celestial. Osaka can be used on walls or ceilings. Hand-printed in a historic 18 inch width in authentic colors, Osaka comes with two companion borders. For more information about Osaka, click on the photo.